The total land area of Pakistan is approximately 310,322 square miles or 88 million hectares of land, of which approximately 20 million heaters are used for agriculture purposes. The river system of Indus and its tributaries provides Pakistan some of the most fertile land in the Indian subcontinent. Under the Indus Water Basin Treaty of 1960 three eastern rivers namely: Sutlej, Beas and Ravi were allocated to India for its exclusive use. The Treaty gives Pakistan control over the western rivers namely: the Indus, Jhelum and Chenab. India has also been allowed to develop 13,43,477 acres of irrigated cropped area on the western rivers without any restriction on the quantum of water to be utilised. India has already developed 7,85,789, acres for which 6.75 MAF has been used. Thus, for the remaining area of 5,75,678 acres, 4.79 MAF would be required on pro rata basis. The water availability in our rivers is highly erratic and unreliable. The highest annual water availability in the recorded history 1922 todate was 186.79 MAF (million acre feet) in the year 1959-60 as against the minimum of 95.99 MAF in the year 2001-2002. This includes the Kabul River contribution. The Kabul River contributes a maximum of 34.24 MAF and a minimum of 12.32 MAF with an annual average of about 20.42 MAF to Indus main. The short-term possible uses by Afghanistan on the Kabul river as stated by the President of Pakistan in his televised speech on 13th September, 2003 would be 8 MAF. 5. The escapages downstream Kotri/outflow to sea. At the time of independence in 1947, the irrigation system, conceived originally as a whole, was divided between India and Pakistan without regard to irrigated boundaries. This resulted in the creation of an international water dispute in 1948, which was finally resolved by the enforcement of Indus Water Treaty in 1960 under the aegis of the World Bank. The Treaty assigned the three eastern rivers (Ravi, Beas, Sutlej) to India, with an estimated total annual flow of 33 MAF and the three western rivers (Indus Jhelum, Chenab) to Pakistan with a transfer of irrigation supplies from the western rivers to areas in Pakistan formerly served by the eastern rivers as well as some development potential to compensate for the perpetual loss of the eastern waters. The whole Sindh in general and the Indus Delta in particular is the worst sufferer of Indus Water Treaty 1960. The Indus Basis Project, including Mangla Dam, with the live storage capacity of 4.82 MAF, five barrages, one siphon and eight inter-river link canals were completed during 1960 -1971, while the Tarbela Dam with the live storage capacity of 9.3 MAF started partial operation in 1975-76. After the partition of the Indian sub-continent, Kotri, Taunsa and Guddu Barrages were completed in Pakistan on the Indus River between 1955 and 1962 to provide controlled irrigation to areas previously served by inundation canals. Also, three additional inter-river link canals were built prior to the initiation of Indus Basin Project. However, immediately before the signing of the Water Accord 1991, water distribution was being made on the basis of adhoc arrangements decided by the Federal Government every year on season-to-season basis ie Kharif and Rabi since 1970. This adhoc distribution was a provisional arrangement in nature and without prejudice to the claims of the provinces. However, prior to 1970 water was distributed under the Sindh-Punjab draft agreement 1945, and sharing of water between 1970 and the signing of the water accord 1991 was made on an adhoc basis. After the dismemberment of One Unit in 1970, the Federal Government on the request of the provinces appointed different commissions/committees, headed by Supreme Court Judges, one after another to examine the problem of inter-provincial apportionment of Indus water, but the consensus could not develop amongst the provinces on Justice Fazle Akbar committee and Justice Haleem Commission. INTER-PROVINCIAL WATER DISTRIBUTION ACCORD 1991: On March 16th, 1991, an agreement was signed unanimously by the then Chief Ministers of all the four provinces for sharing of water, including periods of shortages and surpluses. The agreement is known as the Water Accord 1991. The Council of Common Interests (CCI) ratified the accord on March 21, 1991. Under the accord, 117.35 MAF have been allocated to the provinces for their existing canal systems. Para 14 (a) of the accord says, "The system-wise allocation will be worked out separately on ten daily basis and will be attached with this agreement as part and parcel of it." It may be stated here that 0.87 MAF sanctioned by the President of Pakistan for Karachi Municipal uses has been included in the sanctioned allocation of Sindh under the accord. Just Six months after the accord was signed, the Council of Common Interests (CCI) held its meeting on 16th September 1991 to decide 10-day average system-wise, season-wise allocation for the provinces. In this meeting Punjab expressed the view that it would not be appropriate to take any one clause of the accord in isolation and that the ten daily system-wise allocation by provinces should not be taken in isolation without protecting the existing uses and deciding on future storage's, to which the government of Sindh expressed the view that providing data on 10 daily average allocations on system-wise basis was an integral part of the accord. It would not be appropriate to link other issues such as development of future storage's etc with the provisions of the accord. Sindh further expressed that the Accord 1991 should be religiously implemented and there should be openness in dealing with all issues. In response to Punjab's objections and Sindh's concerns the CCI in the above meeting authorised 10-daily seasonal system-wise adjusted allocations (excluding flood flows and future storage) provided by the provinces to become part and parcel of the water accord. Thus, the CCI did not agree with the view of Punjab that the existing sharing arrangement had to continue during deficit periods in the absence of construction of storage's. This is clear from the fact that CCI approved one set of ten daily statements which forms the basis for distribution in the event of surpluses and shortages, otherwise separate set of ten daily statements should have been approved for sharing shortages during deficit periods as proposed by Punjab. It may further be mentioned that clause 6 of water accord regarding future storage's states "the need for future storage's wherever feasible on the Indus and other rivers was admitted for planned future agricultural development." This clearly indicates that future storage's are in no way connected with sharing of water in the existing canal systems. PUNJAB'S IMPRESSIONS ABOUT THE WATER ACCORD 1991: Punjab generally propagates that according to 1991 Water Accord Punjab's share was reduced by 2.7% and Sindh's share increased by 1.2%. However "Punjab sacrificed and Sindh gained." In response to this propaganda we will have to peep into the past. In the absence of Mangla Dam, water from Jhelum River, an early riser, was making significant contribution in the development of Kharif crop in the southern portion of Sindh under the command area of Kotri Barrage. With the commissioning of Mangla Dam the water was not allowed to Sindh, consequently early Kharif crop got a serious setback. It may be stated that live capacity of Mangla Dam was 5.34 MAF with the replacement component of 3.12 and out of 2.22 MAF of development component, Sindh's share is 1.92 MAF, which has been and remains continuously denied to Sindh. As a result of Indus Water Treaty 1960, India got the exclusive use of total inflows of 33 MAF of three eastern rivers instead of their utilisation of 8 MAF. India thus got 25 MAF in excess of its claims on the three eastern rivers. Consequently with the placement of withdrawal of Trimmu, Islam and Panjnad barrages that were being fed by the eastern rivers on the Indus main with the same priority as that of Kotri, Guddu and Sukkur barrages of Sindh, the withdrawals of Sindh barrages drastically reduced. to 43.67 MAF against its pre-accord sanctioned allocation of 50.92 MAF, whereas the uses of Punjab increased to 54.39 MAF against their sanctioned allocation of 48.33 MAF. Under the Accord Sindh got the allocation of 48.76, including 87 MAF for Karachi Municipal uses and Punjab got an allocation of 55.94 out of 117.35 MAF apportioned to the provinces. From the above discussion it is clear that Punjab's allocation of 48.33 out of a total allocation of 103.30 went up to 55.94 MAF out of a total apportionment of 117.35 MAF. In the case of Sindh its sanctioned allocation was 48.74 out of 103.30 MAF, but with the sanctioned allocation of 2.24 for LBOD Project, Sindh's pre-accord sanctioned allocation was 50.98 whereas it received 48.76 MAF, including an allocation of 87 MAF for Karachi Municipal uses out of 117.35 under the Accord. It will, therefore, be highly unfair and unjust to say that "Punjab sacrificed and Sindh gained" as a result of the accord. The above facts and figures show that it is the other way round. INTER-PROVINCIAL MINISTERIAL COMMITTEE MEETING ON WATER ISSUES IN 1994: Despite the fact the federal government agrees the sacrosanct status of Water Accord of 1991, Sindh has not been receiving its share of water as ensured in the Accord. In 1994 Punjab brought in an ex-agenda working paper before the inter-provincial Ministerial Committee meeting chaired by the then Minister of Water and Power, Ghulam Mustafa Khar. It was proposed in the working paper to share shortages of water between Punjab and Sindh on the basis of 1977-82 average uses. The proposal was bitterly opposed by the representatives of Sindh as it was violative of the water accord of 1991 and against the CCI decision. However, in the minutes to the meeting it was shown that Sindh had agreed to the above-mentioned proposal. "....nominee of the Government of Sindh, I owe my duty to safeguard the due rights of Sindh while implementing water accord ." HE WENT ON FURTHER: "It would be a travesty of truth and distortion of resume to say that there was consensus on the historical uses for sharing shortages. This requires to be deleted. We have discussed within Indus Regulatory System Authority (IRSA) and we are sharing shortages as per Para 2 of accord 1991 and not as per historical uses. MEMON CONCLUDES HIS LETTER BY WRITING: "We would be sowing the seeds of discord on water accord if we include such controversial version as part of consensus in such a high-level meeting. God is Great." "The shortages between Sindh and Punjab will be shared according to the historic uses"
In response, the Special Secretary, Ministry of Water and Power, Government of Pakistan, in Para 2 of his letter No (-2 (156) A/94, dated May 10, 1994 addressed to Chairman IRSA stated. "As you are aware, IRSA is vested with full authority under the Act for resolving inter-provincial issues. The Inter-Provincial Ministerial Committee on water is of an advisory nature and without any legal mandate. The committee is primarily to assist IRSA in attempting a consensus on major issues through a spirit of goodwill and co-operation. All decisions on controversial matters are ultimately the responsibility of IRSA to ensure fair and equitable distribution of water among the provinces"
However, water continued to be distributed under clause 2 of the 1991 accord until Kharif 1999. However, in Rabi 1999-2000 IRSA arbitrarily enforced the recalled decision of 1994, to which the Sindh Government vehemently opposed and the matter was referred by the Chairman IRSA vide his letter NO. PS/Chairman, 1-2/2000/85, dated May 30, 2000 to the Secretary, Water and Power, Government of Pakistan. -- "as per plain interpretation of Clause 14 of the Accord, the ten daily uses, having become part and parcel of the accord, shall be adjusted pro-rata for sharing shortages. Any interpretation of sharing shortages on the basis of historic use shall be violation of the concurrent accord. Moreover, under clause 13 of the accord, IRSA is responsible for implementation of the accord. Similarly, any dispute on this subject should have been referred to the CCI under the Constitution. Hence the formation of any other body or committee or taking any decision or interpretation on such report shall be a distortion of the accord as well as violative of the Constitution." FURTHER, PARA 2 OF THIS ADVICE OF THE LAW DIVISION SAYS: "However, since the matter has not been referred to the appropriate body ie CCI by the aggrieved party, therefore, the existing arrangements as decided by the IRSA, may be allowed to continue till the constitution of and decision of the CCI." "All instructions given on the issue by the Chief Executive regarding IRSA to be implemented immediately along with the apportionment of the water of the Indus River System between the provinces on 16.3.1991. Moreover, the ministerial water accord of 1994 to be annulled immediately." "In pursuance of the Chief Executive Secretariat's directive No F, 100/137/0-1/CES/2000, dated October 23, 2000 and Ministry of Water and Power UO No WI-G (1)/2000, dated June 28, 2001, and its letter of even No, dated November 7, 2001, it is hereby notified that subject decisions of the 1994 Inter-Provincial Ministerial meeting stand annulled." It is noteworthy that IRSA notified the Chief Executives Secretariat's instructions to the provinces after a lapse of eight months. It is also regretfully noted that the water is still being distributed according to annulled 1994 ministerial decision and not under the water accord 1991. "In view of the said directive, regarding apportionment of water of the Indus River System the ministerial award of 1994 is annulled and the accord of 1991 has to be implemented, the opinion already conveyed by this Division on 16.10.2000 is revised and Para 2 thereof is accordingly recalled." The Government of Punjab made a fresh reference on 9.04.2002 asking the Law Division to review the earlier opinion by examining clauses 14 (a) and 14 (b) of the accord in the light of Para 2 of the preamble thereof. The Rules of Business 1973 as stated by the Law Division provide a hierarchy by the authorities for the resolution of the conflict in opinion. In this case since the issue has been examined upto the level of the Federal Law Minister as well as the Chief Executive of Pakistan, therefore, this Division can neither re-open nor review the said earlier communications. The matter can only be resolved by the CCI or the Chief Executive of Pakistan. It seems that unfortunately the water is still being distributed by IRSA as per the annulled 1994 ministerial decision and not under the 1991 accord under the pretext of Chief Executive Secretariat's letter No F.4 (23) C-I/CES/2001, dated 19.1.2002, addressed to the Chairman IRSA and Secretaries of Governor Punjab, and Irrigation and Power Department, Punjab. "The competent authority has been pleased to direct that IRSA may please refer the cases regarding Water Accord/Distribution to the Secretariat for approval before finalising them." After receiving interpretation from the Law, Justice and Human Rights Division on May 20, 2002 mentioned above, the IRSA has no legal, technical and moral justification to distribute water under the recalled 1994 ministerial decision. Therefore, this gross violation should be stopped forthwith and Sindh should be compensated due to less supply of water to the extent of 2 MAF from their allocated share in the accord since the last over three years. As stated earlier the shortages of water is still being shared under the annulled Ministerial Water Formula 1994, and surpluses under the 1991 - accord. Table 2 shows a comparative statement of Kharif water sharing by Punjab and Sindh under 1991 Water Accord and 1994 Formula. The above table shows that under the 1994 formula, the share of Punjab during shortage periods (upto 3 MAF) works out to 1.14 MAF more than its full allocated share of 37.07 MAF and does not share any shortages and they draw from 1.52 to 2 MAF more than their share under the accord during shortages every year. The share of NWFP and Balochistan is not reduced and they get full accord share according to the arbitrary IRSA decision. Thus the full burden falls only on the province of Sindh. Under the circumstances explained above it is only just and fair that the distribution of water must be done under 1991 accord and not under the annulled decision of 1994, as is being done at present. The distribution of water (shortages and surpluses) has to be made on all-Pakistan basis under 14 (b) of the accord. Distribution under annulled ministerial decision 1994 is nothing short of "Robbing Peter to pay Paul." CONSTRUCTION OF NEW WATER RESERVOIRS/DAMS: While considering the proposals of construction of future reservoirs, the first and foremost thing is to ascertain reliable surplus water availability for storage's after accounting for all the existing uses, including water accord-1991 allocations and commitments. It is also necessary to know the sources of water availability, the quantum of water available, so as to have a clear picture of the reliable availability of surplus water for storage's. In this context the Federal Government has constituted technical committee on water resources to give report on surface water availability for future reservoirs and irrigation schemes, filling criteria of Mangla reservoirs and to make recommendations in this regard and lay down operational criteria of link canals and future reservoirs. The committee has not yet given the report in this regard. The committee has to submit its recommendations/report by February 2005. In the absence of the Technical Committee's report on water availability it is premature to take the decision regarding the construction of future dams. Under the Indus Water Treaty-1960, three eastern rivers- Sutlaj, Beas and Ravi-were allocated to India for their exclusive use with an estimated total mean annual flow of 33 million acre feet (MAF) against their established uses of 8 MAF and three western rivers (Indus, Jhelum and Chenab) were given to Pakistan. Kabul, Harrow, Soan rivers are the tributaries of Indus main. Besides, India was also authorised under the 1960 Treaty to develop 1,343.477 acres of irrigated cropped area on the western rivers without any restriction on the quantum of water to be utilised. India has already developed 785,789 acres for which 6.75 MAF had been used, thus for the remaining area of 557,678 acres about 4.79 MAF would be required on pro rata basis, as per reply given by the Minister for Water and Power in the sitting of Senate on August 11, 1988. There is no way of knowing how much water will be available in the rivers in the future. The flow pattern of western rivers is highly erratic and therefore, the available data for the entire period must be considered so that the trend of river flow, including both wet and dry periods, may be properly reflected and analysed for ascertaining reliable surplus water availability for storage's. The annual average water availability for the period from 1922-23 to 2002-2003 is 138 MAF, but WAPDA has used figures for the post-Tarbela period from 1976-77 to 1994 only which works out to 143 MAF, but becomes 140 MAF when updated (for the period from 1976-77 to 2002-2003). Thus out of the available record for a period of 81 years WAPDA has chosen only 18 years of wet period only. The figure of 143 MAF is unrealistic and therefore, water availability of 138 MAF must be taken. These figures had earlier been supported by the federal government data. For example, in 10 years Perspective Plan by the Planning Division, Government of Pakistan and approved by the National Economic Council (NEC), headed by the Chief Executive/President of Pakistan, it has been stated that flows in western rivers vary significantly. Based on 72 years of inflow data (1922-23 to 1994-95) for every 4 out of 5 years, the yearly flows are around 123.59 MAF. Super floods occur approximately once in five years. This may increase the average to a respectable 137.27 MAF per year but in the remaining 4 years the availability of water is 123.59 MAF. These figures when updated until 2003-2004 become 138 MAF on average year basis and 124 on 4 out of 5 years. The Water Resources Management Committee of the National Commission on Agriculture (1987) and the Integrated Valley Development Programme (1989) stated that until there is storage's capacity large enough to absorb above flows for carryover into subsequent years, the development would have to be based on the levels of flows which can be relied upon at least 4 years out of 5. Kabul river contributes significantly to the Indus river water. At present Pakistan has no treaty with Afghanistan for apportionment of water from Kabul river, which contributes an annual average of 20.42 MAF (maximum 34.24 MAF in 1991-92 and minimum of 12.32 MAF in the year 2001-02). Possible short uses by Afghanistan on Kabul river as stated by the President of Pakistan in his televised speech on 13th September 2003 are 8 MAF. Thus the water availability from the western rivers on an annual average basis will become 130 MAF instead of 138 MAF and, on 4 out of 5 years 116 MAF instead of 124 MAF and on Kharif basis will be 106.84 MAF instead of 114.84 MAF after adjusting less supply of 8 MAF from Kabul river. Since the three eastern rivers were allocated to India for its exclusive use under the Indus Water Treaty, 1960, so there is no justification to include a portion of water into the total availability of water in the Indus system. Even WAPDA, in the Water Management Committee Report 1987, had conceded that after completion of storage reservoir on Ravi (Thein) in 1989, there will be no significant flows from the Eastern rivers in Pakistan except for occasional flood flows towards the end of monsoon. During this period we ourselves throw flood water into the sea. "In the long run it would be no favour to India to help it acquire the last drop of the water Pakistan now receives from the eastern rivers." Furthermore, in the programme for Water and Power Development in West Pakistan through 1975 by M/s Harza Engineering Company International prepared for WAPDA in January 1964, the contribution from each of the eastern rivers has clearly indicated as zero. In 1992 post-accord computation, WAPDA accepted the position that the eastern rivers having been allocated to India, no contributions from these rivers can be expected. However, for the first time they came up with a fantastic idea that some flow is generated from the eastern rivers from the catchments above rim stations within the Pakistan territory. It is really hard to understand how this discovery was made by WAPDA, 32 years after the signing of the Indus Water Treaty in 1960. The figures incorporated by WAPDA in the 1992 computations on account of the flow generated in Pakistan was 1.3 MAF, where as in 1994, this figure was increased to 4 MAF which is double the WAPDA's own figures of 1987, when it was assumed by it (through wrongly) that some flow will be coming from India without generation within Pakistan. This is absolutely incorrect, because there are a number of link canals, which join Ravi and Sutlej rivers upstream of the rim station barrages and transfer water to these barrages from the western rivers. The additional flows reaching the rim stations of eastern rivers are therefore, not just the flow generated in Pakistan, but the water transferred to the eastern rivers from the western rivers. The additional flows reaching the rim stations of eastern rivers are, therefore, not just the flow generated in Pakistan, but the water transferred to the eastern rivers from the western ones through link canals. It may also be stated that the catchment area of each of the eastern rivers above rim stations in Pakistan is very small, so the generation of huge flow of 4 MAF within Pakistan is out of question. Moreover, in the document "Anticipated water availability and operation of Indus Basin System, during Kharif season 2003," IRSA has indicated a maximum of .741 MAF and a minimum of .413 MAF as a component from the eastern rivers for distribution of water to the provinces. Under the circumstances it is unrealistic to assume that there will be any generating flow of eastern rivers within Pakistan. The eastern rivers' contribution must, therefore, be taken to be zero, and not 8 MAF as incorrectly shown by WAPDA. Thus the net water availability both from the western and eastern rivers, after accounting for short term uses of 8 MAF by Afghanistan from Kabul rivers works out to 130.09 MAF on annual average basis, 116 MAF on 4 to 5 years basis and 106.84 MAF on annual Kharif basis and not 151 MAF on annual average basis (143 from the western rivers and 8 MAF from the eastern rivers) as incorrectly indicated by WAPDA. Lot of publicity is being made that a huge quantity of 35 MAF on annual average, post-Tarbela period from 1976-77 to 2002-2003, is flowing into the sea, which should be utilised by building new storage's. In this context it may be stated that water presently going into the sea includes the following commitments/uses. The above table clearly shows that there is shortfall from 13 to 30.90 MAF under different scenarios between water availability and requirement/commitments instead of any surplus availability for construction of storages. Water availability for justification of construction of a dam as stated in earlier Para is for 80% percent of the time that is (4 our of 5 years) whereas water availability is only 18% of the time as shown above. The water reservoirs are required to compensate for water losses due to silting in the existing dams but it is also necessary to take steps to reduce the silting in the dams and to monitor the silting on year-to-year basis and to carry out analytical studies of silting phenomenon and finding out the solutions of the problem. The data regarding the silting of reservoirs are not published by WAPDA every year and no graphs and charts are available to study the silting quantum and trends under different river flow conditions. For desilting of dams WAPDA should focus on silt reducing measure, like water shed management, construction of any new reservoir or link canal. It is further alarming to point not that despite this dismal water availability scenario WAPDA in its documents Vision 2025 has shown the programme of Reservoirs requiring 59 MAF and new canals requiring 5.5 MAF. All these projects are unrealistic as there is simply no surplus water available to support them. And also attention should focused on silt exclusion devices like operation of flushing tunnels of which the provision exists in the reservoirs. As regard to Tarbela reservoir WAPDA has conducted a study through international consultants (TAMS) but their recommendations have neither been implemented nor any reason given for ignoring them. Nevertheless, from the data provided by WAPDA in 1998, the silting in the live storage portion of the existing reservoirs upto year 2010 would be about 3 MAF which will be offset by the raising of Mangla reservoir, the work on which has already been started and is likely to be completed before 2007. It is, however, necessary to ensure proper monitoring of the silting process in live and dead storage portion separately and to publish the necessary data and charts for public information. It is also necessary to take early decision on the recommendations of TAMS on Tarbela reservoir for the exclusion of sedimentation. Moreover, Kalabagh Dam already stands rejected by all three smaller provinces and their Assemblies have passed unanimous resolutions against the project. The protests against this project are still continuing in all the three smaller provinces. According to TAMS reports the silt exclusion devices for Tarbela Dam suggested by them will exclude the possibility of construction of Kalabagh Dam. THE REGULATION, OPERATION AND MANAGEMENT (ROM) OF EXISTING RESERVOIRS AND INDUS LINK CANALS: Under Indus Water Treaty 1960 Mangla, Chashma and Tarbela reservoirs and two Link Canals (C-J and T-P) were constructed to transfer water from Indus to its tributaries, when water is surplus to the requirements of the lowest riparian. Before considering any new reservoir project it is important to review the regulation, operation and management (ROM) of the present reservoirs and Link Canals. In this context it is important that the following basic criteria for ROM of reservoirs are properly and faithfully observed. 1. The reservoirs are water banks, where water is stored in Kharif season only when it is surplus to the requirements/allocations of the present canal system for subsequent use during shortage periods, particularly the following Rabi season. 2. During the Kharif season itself the reservoirs are to be used for balancing so that the fluctuations in the river flows are absorbed and a steady flow maintained in the river downstream even during shortage periods. 3. The Indus Link Canals are to be operated only when the water in Indus is in excess of the allocations/requirements of the canals settled on that system and there is shortage in the tributary rivers. The experience of the past has, however, shown that these basic criteria are not being observed. Water is stored in the reservoirs, especially in Mangla, during the periods when there is extreme shortages of water in the lower riparian provinces of Sindh and Balochistan. In addition, the Indus Link Canals (C-J & T-P) are opened when there is an acute shortage of water in Sindh and Balochistan. To sum up, water has to be stored in the reservoirs only if it is surplus to the allocations/commitments, not at the cost of lower riparian provinces. CONSTRUCTION OF GREATER THAL CANAL: The controversial Greater Thal Canal project had been vehemently opposed by the Government of Bombay even before the creation of the province of Sindh (1935) on the grounds that it would hit the vital interest of lower riparian ie Sindh, amid the land to be brought under cultivation is barren waste with no hope of producing anything. The British Government upheld these objections. Since then the project had been brought up for consideration for a number of times but was not approved by the competent forum. The project, however, was considered and deferred by Executive Committee on National Economic Council (ECNEC) in its meeting held on August 19, 1975. THE PRESENT PROPOSAL: The proposed Greater Thal Canal off-takes from Chashma-Jhelum Link Canal on river Indus. The estimated cost of the project is Rs 30.47 billion. The designed discharge of its head regulator, which was previously constructed, is 15,000 cusecs and that of canal itself is 8,500 cusecs. The canal will provide irrigation water for an area of 1.5345 million acres located in Bhakhar, Layyah, Khushab, and Jhang districts. It is claimed that 1.9 MAF is available under the water Accord although there is no such provision in the Accord. The provision of water for GTC was made in a clandestine manner by Punjab in draft ten daily statements in contravention of clause 14 (b) of the Accord. Para 14 (a) and (b) are reproduced below. ARTICLE NO. 14 (A) OF THE ACCORD SAYS: The system-wise allocation will be worked out separately on ten daily basis and will be attached with this agreement as part and parcel of it." PARA 14 (B) OF THE ACCORD SAYS: "The record of actual average system uses for the period 1977-82 would form the guideline for developing future regulation pattern. These ten daily uses would be adjusted pro-rata to correspond to the indicated seasonal allocations of the different canal systems would form the basis for sharing shortages and surpluses on all Pakistan basis." As a first step Punjab prepared the following statement table-I Appendix-A under para 2 clause 14 (a) showing the actual average system-wise uses of their canals which existed during the period 1977-82. Table-I Appendix-A clearly shows that Punjab while submitting ten daily statements under clause 14 (b) did not adjust on pro-rata basis system-wise uses of the existing canals shown under 14 (a). Instead of adjusting pro-rata basis of the difference of 2.42 MAF (difference between allocation 37.07 and historic uses 34.65) it was shown for two non-existing and unsanctioned schemes, viz. CRBC Punjab portion and Greater Thal Canal. This is a clear and blatant violation of Para 2, Clause 14 (b) of 1991 Accord. It may be mention that no other province, except Punjab, included any new canal in their ten daily statements. The CCI in its decision of the meeting held on September 16, 1991 authorised ten day seasonal system-wise adjusted allocations (excluding flood flows and future storages) provided by the provinces as revised to become part and parcel of the water accord. "System-wise adjusted ten daily allocation of the provinces was presented before the CCI and it was agreed except the inclusion of Greater Thal Canal which is an unsanctioned project. In this regard, the Federal Secretary, Water and Power was asked to look into this issue and get it corrected to bring it in line with the water accord requirements." The Ministry of Water and Power, Government of Pakistan, did not circulate the adjusted pro-rata ten dailies as decided by the CCI. On the contrary, they circulated ten daily statements, as submitted by Punjab, in violation of Para 2, Clause 14 (b) of the accord, as mentioned: table-IV Appendix-A. Moreover, it is pertinent to point out that the circulated ten dailies by the Ministry of Water and Power are unsigned, whereas each page of the water accord 1991 was signed by all the provincial Chief Ministers and their nominees. Under Para 2 of the Accord, 117.35 MAF of water has been allocated to the provinces. 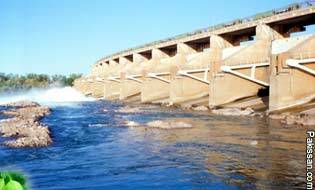 Under Para 4 of the water accord, the shares of the provinces from the balance-river supplies (including flood supplies and future storages) have been prescribed. The accord also recognises the need for flow downstream Kotri for which 10 MAF water has been tentatively provided, pending further study to be carried out by an international panel of experts. Moreover according to provision of the accord, the water requirements of LBOD scheme ie Nara canal remodelling and Chotiari reservoir should also be met from the flood flows. The LBOD scheme was ongoing at the time of signing of the water accord. As aptly described in chapter 18 of Planning Commission documents, "Ten-year perspective plan and three-year development programme (September, 2001)" and approved by the National Economic Council (NEC), chaired by the President/Chief Executive of Pakistan, that floods occur once in five years on the average. No flood irrigation scheme can be based on uncertain and irregular flows, which may occur for a few days in a period of five years and even longer. If the canal is constructed, it can operate by depriving the existing canals of their due share of water. Thus neither there is any provision for Greater Thal Canal in the water accord nor floodwater can be provided for it. The mandatory guidelines of the Planning Commission/ECNEC provided that for any project costing Rs 50 million or more, feasibility study is a 'must'. WAPDA got the PC-II for feasibility study of Greater Thal Canal approved by CDWP in November 2000 for completion in a period of three years. However, without waiting for completion of feasibility studies, WAPDA got ground-breaking ceremony performed in August 2001 and even started the work. The PC-I form was submitted to CDWP on 4th February 2002 without feasibility report and water availability certificate of IRSA (which was managed subsequently in May 2000, Member Sindh dissenting). The project was cleared by CDWP within 4 days on 8th February 2001, without participation of the Sindh Government. The project was also cleared by ECNEC on 28th February 2002 under similar conditions. The economic viability of the project (ie cost benefit rates and rate of return etc) considered and approved by ECNEC in February 2002 is highly dubious under the project intensity for a non-perennial canal is shown as 61.4% in Rabi. The production as well as prices is on very much the high side to exaggerate the benefits whereas costs are under-estimated. In this context, the World Bank in its report on July 15, 2004 questioned the economic viability of the three ongoing projects (Greater Thal Canal, Kachi and Rainee Canals), and five proposed irrigation projects (Sehwan Barrage, Chashma Right Bank 1st lift Irrigation, Akhori Dam, Dhok Pathan Dam and Sabakzai Dam). The Sindh Provincial Assembly has passed two unanimous resolutions against the construction of Greater Thal Canal recently. Moreover, there is a strong agitation against the construction of Greater Thal Canal throughout the length and breath of the province of Sindh and southern Punjab (Seraiki belt). It is therefore, appropriate that further work on the GTC project be stopped forthwith in the supreme national interest and provincial harmony. ESCAPAGES BELOW DOWNSTREAM KOTRI: It is being stated that the annual average of 35 MAF of water have flown into the sea during the post Tarbela period (1976-77 to 2002-2003). All this water in fact is not surplus and available for utilisation. Following adjustments have to be made. The above table shows that there is a shortfall of 13 MAF of water between the availability and commitments. An official report says that fresh water flow of Indus River has been reduced from 150 million acre feet (MAF) a year some 60 years ago to 0.72 MAF in the year 2001-2002. Experts say that there has been virtually no sweet water flow in the sea during 2002-2003 which signals an acceleration in the pace of the devastating phenomenon in the coastal areas of this unfortunate province. The quantity of outflow to sea has been progressively reducing, particularly after the construction of more barrages, dams and link canals after the signing of Indus water treaty, 1960. The actual outflow to sea at the time of independence was above 80 MAF annually which have now reduced to 35 MAF. The duration of the flow has also reduced to less than two months and that also only in high flood years. Even this quantity is dwindling further as unutilised allocations of water are being harnessed. CLAUSE 7 OF WATER ACCORD 1991 READS: "The need for certain minimum escapages to sea, below Kotri to check sea intrusion was recognised. Sindh held the view that the optimal level was 10 MAF which was discussed at length which other studies indicate lower/high figure. It was, therefore, decided that further studies would be undertaken to establish the minimal escapages needs downstream Kotri. Under the provisions of water accord 1991, the quality of 10 MAF has been provisionally earmarked for outflow to the sea. Unfortunately, the studies have not been initiated even after 13 years of signing of water accord due to frivolous objections raised on the terms of study. However the IUCM, an international organisation based in Pakistan, has worked out the annual requirements for outflow to sea for environmental sustenance to be 27 MAF. This corresponds to 300,000 cusecs discharge flowing for a period of 45 days. Whereas, the World Commission on Dams has identified that 29 countries seek to minimise Eco System impact created due to large dams. The Commission has further recommended the environmental flow requirement as 10% of the annual run off which comes to 14.2 MAF downstream Kotri instead of 10 MAF demanded by Sindh during 1991. It is shocking that in the year 2003 there had been virtually no sweet water flow in the sea, a signal for acceleration in the pace of the devastating phenomenon in the coastal areas of Sindh. In order to save the environment from complete devastation there is an urgent need to plan future projects so that the minimum required discharge of 300000 cusecs is available for outflow to sea at least for as much time as it is available, after meeting the Kharif demands. This figure of 300000 cusecs is also supported in WAPDA's exercise of 1992. Indus delta originally occupied an area of 6 lakh hectares consisting of 17 major creeks. Currently with reduced water only two creeks - Hajamro and Kharak - receive water and there is only one outlet to sea ie Khobar Creek. The active delta is only 10 percent of the original area. Under this phenomenon, when fresh water is withdrawn faster than it can be recharged near coastal line sea intrusion occurs. The sea water intrusion has resulted in damage of 1.2 million acres in delta covering two districts viz Thatta and Badin and eight Talukas/Tehsils. The World Report of Environmental Management 1991 identified a number of environmental problems in Pakistan, including the extinction of coastal mangrove forest. The mangrove forest area was spread over 700000 acres, which is now suffering badly. According to satellite survey 1998 the mangrove cover has been reduced to 400,000 acres, of which an area of 125,000 acres is healthy. The Indus river used to throw 400 million tons of silt in the sea every year, which has now been reduced to barely 100 million tons a year. This gradual depletion in flow of sweet river water and rich silt into sea has led to what is called "hyper saline condition" in the coastal area that literally kills life in all forms, LIVESTOCK and vegetation on land and fish and other edible marine varieties and rich mangroves forest in the Sea. An estimated 40 to 50 ppt (particles per thousand) salinity level at present which when compared to 15 to 20 ppt half a century ago has already crossed the "dead level mark." On the other hand, sea mangroves and the delta area mangroves have been devastated to the extent of two to three lakh acres. Fishing as well as fish farming, cattle farming and dairy farming have sustained severe damage, or even destroyed. Rivarian forest spread on six to seven lakh of acres on the both sides of the river Indus, totally depending upon the flood water of the Indus are on the verge of extinction. Kacha area of Sindh starting from Obaro (district Ghotki) to Keti Bander stretched to on about 2 million acres on both banks of river Indus, which were rich in crops, forests, cattle, fisheries etc have also almost been eliminated. As such, Sindh has lost a world. Poverty has increased due to this situation and as result a massive-scale migration is witnessed in the coastal areas of both the districts of Sindh (Badin and Thatta). The famous Palla fish has become nearly extinct. The annual production reduced from 5000 tons in 1951 to 220 tons, besides marked reduction in its size. The rare species of freshwater dolphin are also facing similar threat. 600000 acres of riverian forests and 550000 acres of Sahlaba areas of Sindh have been very seriously affected and they are in the danger of complete elimination. Whole Sindh in general, and Indus delta in particular, are the worst sufferer of Indus Basin Treaty and the construction of Tarbela Dam, Mangla Dam as well as other barrages constructed afterwards not only on Indus but on its tributaries. It is a historical fact that before signing of Indus Basin Treaty and its follow-up actions according to an estimate more than one hundred million acre feet (MAF) water used to flow downstream Kotri in the sea annually. As such this quantum of water flow downstream Kotri is a historical right of Sindh. Pakistan is a signatory of Rio Declaration signed by the Prime Minister Nawaz Sharif. The Principle No 4 of this declaration proclaims that "in order to achieve development environmental protection shall constitute an integral part of the development process and cannot be considered in isolation from it." We should, therefore, do all that is possible to abide by this commitment in letter and spirit. The President of Pakistan is on record to have stated that during low flow years water from allocation of provinces should be diverted for outflow to sea to mitigate the hardship of the people of Thatta/Badin districts in coastal area. The time has come that justice must be done to Sindh and be given its due share instead of further depriving of whatever has been made available to it, by construction of more dams and canals, particularly in the present water scenario where there is even no water to meet the allocations/commitments of the day. Unfortunately, the study for the requirements of outflow to sea has not even been started in spite of lapse of 13 years. Punjab, which wanted one line TOR for the study, did not accept the comprehensive TORs drafted by UNDP (besides the grant provided by them for the study). Subsequently, Punjab proposed two separate studies instead of one study, which was not acceptable by Sindh as it was against the provision of the water accord. The CCI in its meeting held on 16th September, 1991 has directed that "the study proposed to be carried out by an international panel of experts to establish minimal escapage needs downstream of Kotri should be completed within one year of the signing of the agreement with consultant. This directive of CCI seems to has been completely ignored. Recently the Parliamentary Committee on Water Resources has decided to conduct three studies on the subject including the environmental study related to downstream Kotri. This is a clear and blatant violation of CCI decision. The Parliamentary Committee on Water Resources is a recommendatory body, which cannot take decisions against the express decision directives of CCI. Moreover the same item of downstream Kotri also falls within the purview of technical committee on water resources. As per the directives of the President both committees have to work in close co-ordination. The decision of the Parliamentary Committee without consulting the Technical Committee is a violation of the President's directives. The studies are being let out to some local consultants, with shady track record, though the CCI has directed that the study is to be carried out by an "International panel of experts," which is a clear violation of CCI. A) Stop the three studies to be conducted through local consultants with shady track record. B) Consult the Technical Committee on water resources before proceeding further. This paper has sought to examine the water distribution and sharing amongst the provinces, the construction of future reservoirs, the management of existing reservoirs, the construction of GTC and escapages below downstream Kotri. As noted in the foregoing discussion that Sindh vehemently opposed the distribution of water under the 1994 Formula, the construction of Kalabagh Dam and Greater Thal Canal for valid technical, legal and constitutional reasons. Justifying the unholy 1994 distribution formula if has deliberately altered the part of water accord 1991 relating to water sharing. Therefore, water must be distributed amongst the provinces in accordance with the clear, specific and unambiguous provisions of the water accord 1991. The Accord is the binding force amongst the provinces and an instrument of inter-provincial harmony. Despite this if this document has to be annulled or modified it can only be done by consensus amongst all the provinces and with the approval of CCI. The biased propaganda regarding Sindh's opposition to water development projects must be stopped forthwith. This is a viscous attempt of Sindh-bashing. Sindh never opposes any water development project, which does not affect its legitimate rights and interest, being the lower riparian province. Frequent attempts have also been made to project Sindh for giving incorrect figures. Actually the figure of 123 MAF of annual water availability in four out of five years attributed to Sindh in fact, is the figure taken by the Planning Commission in its document entitled "Ten Years Perspective Development Plan 2001-11" and "Three Years Development Programme 2001-04" which has been approved by the National Economic Council (NEC), headed by the Chief Executive President of Pakistan and quoted by Sindh. In order to save water losses in the system, water conservation like lining of canals/watercourses particularly in saline areas, should be undertaken immediately. In addition, improvements in the agriculture practices such as precision land levelling should be undertaking at massive level. In sum, the unanimous resolutions passed by the Provincial Assemblies of Sindh, Balochistan and NWFP against the construction of Kalabagh Dam, and two resolutions against the Greater Thal Canal passed by the Sindh Assembly must be followed and honoured.